Lactate flange sealant ideal for use on rigid metal flanges. 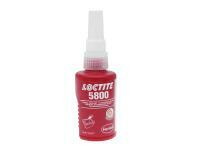 LOCTITE 5800 seals close-fitting joints between rigid metal faces and flanges. It cures when confined in the absence of air between close-fitting metal surfaces. Used as a form-in-place gasket on rigid flanged connections. Provides resistance to low pressures immediately after assembly. Its key differentiator is the “White” Material Safety Data Sheet. It carries no hazard symbols, risk or safety phrases and does not contain any declarable carcinogens, mutagens or reproductive toxins. Fixture time aluminium: 20 min.